Offering an outdoor pool and a restaurant, Cu Guest House is located in Phalaborwa and provides air-conditioned accommodation with free WiFi access. A spacious garden is at the guests' disposal. Units here come with a patio and a view of the garden, a flat-screen satellite TV and a desk. An electric kettle and a fridge are provided as well. The showers are situated within the room and free toiletries are provided. CU Guest House offers an on-site bar and meeting facilities. Billiards can also be played on site. The Kruger National Park is 4 km away from the property. A number of nature reserves can be found in the surroundings. The guest house is 3.5 km from Phalaborwa Gate and 4.9 km from Hans Merensky Golf Club. Free private parking is provided on site. We speak your language! Cu Guest House is conveniently situated at the entrance to Phalaborwa, affording the tourist and business traveler easy access to the town and surrounding areas. Cu Guest House provides the ideal base from which to explore the wonders of the South African bush veld, being five minutes drive to one of the main gates of the renowned Kruger National Park, and numerous other low veld attractions. The town is served by the Kruger Park Gateway Airport which has daily flights to and from Johannesburg. Cu Guest House offer comfortable Twin and Double Rooms to beautiful Patio and Garden View Units overlooking a sparkling pool. Free private parking is available on-site, giving you piece of mind and making sure you have a rest assured stay with us. Cu Guest House are widely known for our friendly and courteous staff. Treating our guests as family every time they come to visit. From a comfortable outdoor dining area through to our BBQ, and beautiful outdoor pool, let it be for business or a quick stay, Cu Guest House let you enjoy every second of it. 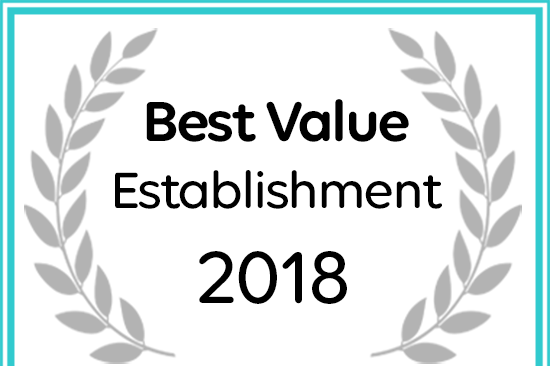 Afristay has named CU Guest House a 2018 Best Value Establishment.